Sometimes the best remedy for the doldrums on a cold winter day is a warm skillet meal. 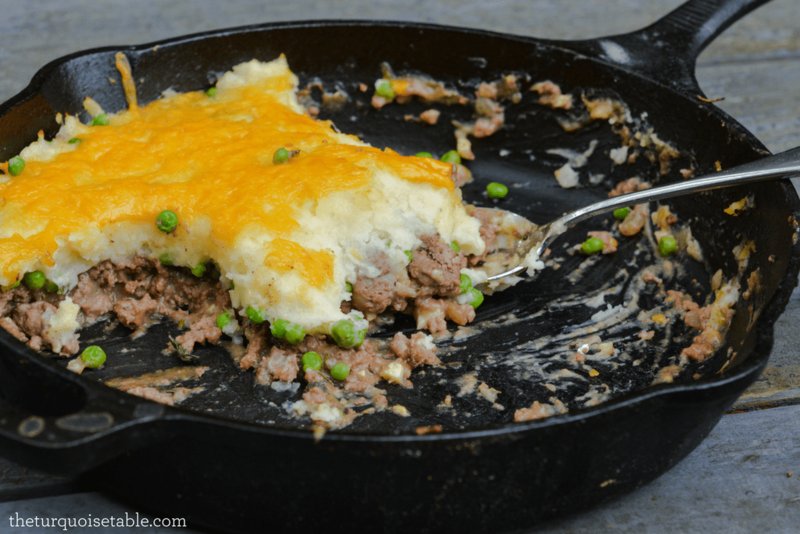 Y’all know how much I love my grandmother’s cast iron skillet – seasoned to perfection – and this Skillet Shepherd’s Pie is a wonderful way to warm the bellies in your home. The fresh rosemary & parsley adds a fresh zing to this traditional dish. Try it and let me know what you think! In a cast iron skillet sautee onion, carrot, and meat. Cook until browned, 8 to 10 minutes. Drain the fat and add the broth, tomato paste, and herbs. Simmer until the juices thicken, about 10 minutes, then add the peas. Meanwhile, bring the potatoes to a boil in salted water. Cook until tender, about 20 minutes; drain. Mash the potatoes with the butter, milk, and salt. Spread the potatoes over the meat mixture. Top with cheddar cheese. Bake until golden, 30 to 35 minutes.